The thing is, to keep this wireless charger's cost down, the intrepid inventor has used cardboard as the casing. Not only does this give the charger a certain, shall we say, "rustic" look, but as the inventor admits it's “probably” a fire hazard as well. 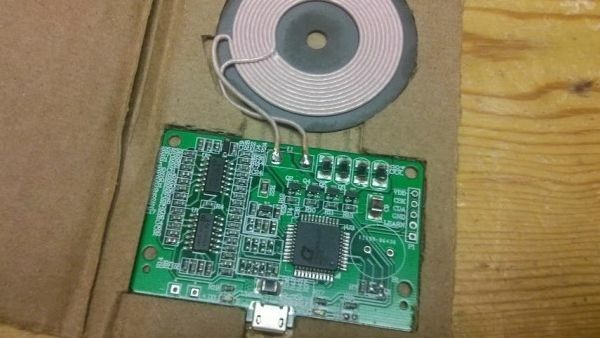 The creator, known as PAY_CLOSE_ATTENTION on Reddit, had ordered parts to create the wireless charger using a slightly safer (but still really quite flammable) wooden case. When the charging port broke they improvised a new case out of cardboard, cutting holes to fit the modules and ports and wrapping it all up with some electrical tape. It's certainlyinventive but encasing electric technology that's known to get hot in cardboard isn't perhaps the best idea. Companies charging high prices for their products sometimes force determined DIYers to try their hand at building their own versions. This doesn't always end well. Ever wanted to have one of those lawn mowers you drive? Too expensive? Why not save money by combining a bicycle and a lawn mower? Oh right. Lots of reasons. For Tim Cannon wearable tech that you wear on the outside of your body wasn't going far enough, so he went ahead and implanted a device into his arm that monitors changes to his body temperature. The problem is that it's quite a big device, which protrudes from under his skin. At least it has LEDs which light up Cannon's tattoo, but we'd rather stick with thermometers for now. A fake website has appeared claiming a new exclusive feature of iOS 8, titled 'Wave', allows iPhone users to quickly charge their phone by sticking it in the microwave for 60 seconds. The website tries hard to look like an official Apple site, even warning people to not “Wave-charge for over 300 seconds”. Apart from a few unverified images of burnt iPhones, we're not sure how many people have been fooled by this, but just to reiterate, do not put your iPhone in a microwave.